Did you know that you have the power to determine who gets to win the US$100,000 pot money at Asia's Got Talent until 11:59 pm tonight, SIngapore, Malaysia Standard time? 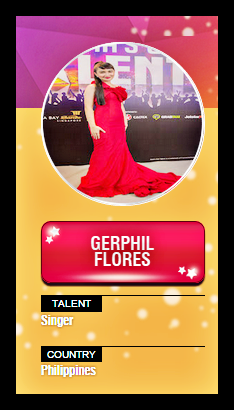 Please take the time to vote for Gerphil Flores, the Philippines' Golden Girl with the Golden Voice . She needs your help if she’s going to be crowned the Grand Finals winner! To make Gerphil Flores' (AGT8) dreams come true, vote for her now! Note: *Please make sure to double click the photo of your favorite artist. It is important for you to receive a confirmation in your timeline to make sure that your vote is counted. *You can only vote using one account per contestant during the entire duration of voting period. *make sure to double click our photo and you should receive a confirmation in your timeline. With voting closing on 11 May 2015 at 2359 hours (11:59 PM) Singapore and Malaysia time, the responsibility of making Asia’s first ever star now rests on TV audiences across the region. Sony Pictures Television Networks, Asia was established in 1997 with Singapore as the Asian headquarters of Sony Pictures Television's networks business. It operates six ad-supported 24/7channels which are wholly-owned by Sony Pictures Entertainment. AXN is the home of thrilling entertainment; beTV is the place to be for the best of TV; Sony Channel is the premier destination for female-skewing Hollywood entertainment; Animax offers anime for all; ONE is powered by prime and current South Korean entertainment content; and GEM serves up star-studded and popular general entertainment programming from China, Hong Kong, Taiwan and South Korea.